When choosing a lawyer to represent you in your personal injury case, it is important to think about hiring an attorney with training and experience in Arizona personal injury law. The attorneys at My AZ Lawyers have the knowledge and expertise needed for your case, and you will work with the person best suited for your case’s specific details. Our Arizona attorneys can help guide you past the strong emotions that often times come with the unfortunate circumstances related to a personal injury lawsuit, and help you build a detailed and realistic case. Our trial lawyers have extensive experience in the courtroom and can protect you and gain the best possible outcome during contested proceedings. Our personal injury law firm will protect your rights and prioritize your needs. Each case has its unique and specific circumstances, and our lawyers consider each client’s individual case and work to achieve the best desired outcome for each personal injury case. A basic legal education is not enough to provide expert personal injury representation, so choosing the right lawyer is essential to getting a successful outcome for your case. Our attorneys have the additional specialty training in the Arizona personal injury laws to make them experts in their subject matter and better poised to represent you. Don’t choose just any lawyer to represent you. The stakes are too high, and you have too much to lose. Choose an attorney with experience, and a reputable law firm that you can trust. 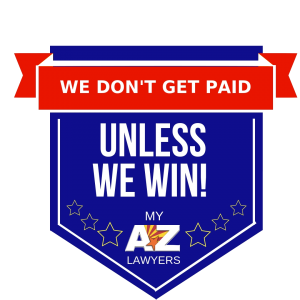 Call My AZ Lawyers to connect with a lawyer who has that training and experience and who is dedicated to using it on your behalf. legal service in order to defend clients against charges, and to get the maximum compensation they may deserve under the law.